There are many long straights down the West Coast but there are also enough winding sections to make SH6 more than a little bit appealing. Forget about the Great Ocean Road in Oz; this stretch of coastal tarmac is both more scenic and interesting from the driver’s seat, with vastly less traffic and no stupid 80kay speed limit. The curly bits snake their way through old forests and are pretty slick at this time of the year. A good thing then that the X4 is not the silent type when it comes to communicating subtleties; it’s all about the free and open sharing of information, like Wikileaks. You know exactly what the X4 has left in its grip arsenal and it takes a fair effort to induce any ESP intervention. To maximise the mechanical marvel that is BMW’s active rear diff and achieve supernatural levels of cornering, it’s better to brake a little earlier, and then start gassing it up as you turn in. It seems weird at first but it gets the system working a treat for you. You feel the rear end turning the car and the front digging in rather than scrubbing wide. Long uphill curves are usually a lesson in patience in an SUV, with power-on understeer dominating the moment you give the throttle pedal just a fraction more jandal, but here too the diff will help power you around safely rather than sliding you across the road. Think rails and glue here. The 35d comes standard with variable M suspension lending it additional ride quality when set to Comfort mode. We slotted the Sport mode a few times but found it gave the bump stops a hard time over the rain- and snow-ravaged sections of SH6. But even in Comfort, there’s plenty of fine body control while the tyres have a better chance of staying in permanent contact with the road. While it can be advantageous to activate the Sport Plus mode on BMW’s rear-drive products to really appreciate the chassis without the ESP intervening, these xDrive equipped models have grip to burn so there’s just not the same ESP action. The gearbox needs a poke along though and merely knocking the lever over into Sport generally does the trick. The steering too is well configured and with standard variable sport steering it turns quick and sharp. The level of assistance and feedback are enough for the enthusiast while not being too heavy or alive for the housewife or socialite-type owners. For a high-riding rig that supposedly weighs around 1,930kg, its dynamic ability impresses. There is 204mm of ground clearance so it can go a little off road too. However, a wee side excursion down a 4x4 trail had us wondering whether it was such a good idea to go adventuring in a remote place with no spare, knowing that the nearest 20-inch P Zero was probably a few hundred kays away in Christchurch. But hey, if the gooey puncture repair kit fails and you have to wait around for a replacement tyre, it’s not like there isn’t plenty to explore on foot down the Coast. It seems like every few kays there is some trail disappearing somewhere up into the hills and beyond. Even if you did have a situation on your hands, it’s probably something BMW’s Concierge Service could manage. BMW is pushing its ConnectedDrive with the X4. It’s all about connecting car and driver to the marvels of the web. 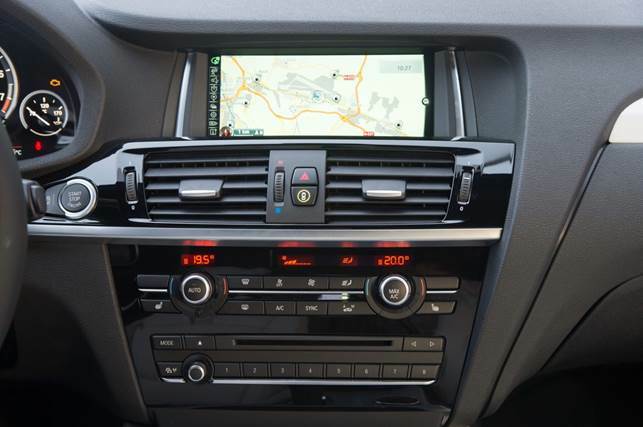 Delve into the submenu of the infotainment system and you’ll find an Internet portal navigable via the iDrive. It takes some time to master, while there are also aspects such as a news service and the like that are, in reality, easier to digest via your smartphone.